Janice: "I am telling you that my daughter is not possessed." Elliot: "We're not talking about possession. We're talking about reincarnation." Robert Wise has directed some really great films; The Sound of Music, West Side Story, The Andromeda Strain, and The Day The Earth Stood Still are but a few of his premier projects. 1977's Audrey Rose, based on the best-selling novel by Frank De Felitta, was also directed by Wise, and doesn't come close to the quality of some of his other works. I suspect the real culprit is an overly wordy screenplay that misses the novel's inherent creepiness. Janice (Marsha Mason) and Bill (John Beck) Templeton are a seemingly well-to-do couple living in Manhattan, with a happy eleven-year-old daughter named Ivy (Susan Swift). Janice and Bill both begin noticing a mysterious bearded stranger lurking about, who seems to have an unusual interest in young Ivy. As things slowly begin to unravel, Ivy is plagued by a recurring series of nightmares that seem to occur every year near her birthday. The nightmares cause her to run around her room frantically, screaming, "It's hot!" The stranger, Elliot Hoover (Anthony Hopkins), finally approaches the Templetons, and presents to them a very unsettling scenario. Elliot firmly believes their child to be the reincarnated soul of his dead daughter Audrey Rose, who died in auto accident only moments before Ivy was born. As expected, this leads to some heavy-duty conflict and turmoil between Janice and Bill, who are split on whether or not to believe Elliot. Ivy's nightmares become more intense, and Elliot's involvement with the Templetons gets more entwined. De Felitta's novel was a pretty chilling yarn, yet his screenplay adaptation gets bogged down with far too many rambling sequences that seem to be constantly going over the same ground. The first half-hour is done well, but it is the drawn out middle portion that kills the tension. By the time the intense final fifteen minutes arrive, Audrey Rose seems to rush to a conclusion that is all but glossed over. As expected, Anthony Hopkins (Hannibal) gives another high-caliber performance, and his name on the DVD cover will undoubtedly contribute to rentals from the curious. Hopkins' Elliot is wonderfully nervous, with an air of controlled insanity, and his acting certainly eclipses the stiff recitations of John Beck and the whiny theatrics of Marsha Mason. As Ivy, Susan Swift is very natural, and with the exception of a couple of glaringly awful line readings, her performance is incredibly realistic. She can turn on an eerie, far away look that can be very spooky, and her nightmare scenes come across as perfectly tense and disturbing. The subject of reincarnation is fascinating, and Audrey Rose does raise some interesting "what if" questions. Wise provides some stylish visuals (especially the pagan-like snowman fire ritual sequence at Ivy's school), but even a skilled director can easily become handcuffed by a script that contains too many long, uneventful dialogue passages. Audrey Rose's subject matter is compelling, but the final product suffers from a general lack of suspense. 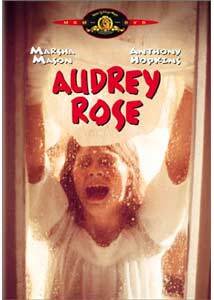 Image Transfer Review: MGM's DVD release of Audrey Rose is presented in a 1.85:1 widescreen anamorphic transfer. For a 1977 film, the colors here are rich, with pleasant flesh tones. That is where the good news ends, however. MGM obviously did not go to any great lengths to restore Audrey Rose, as this print is littered with white flecks. In some scenes, particularly dark ones, it almost seems that it is snowing. Black levels offer little contrast, and do not provide any substantial shadow depth. Significant grain is evident more often than not, which I find incredibly disturbing. A distractingly marred transfer contributes to the downfall of Audrey Rose. Audio Transfer Review: An English mono mix, limited as it is, sounds more than adequate here. As Audrey Rose is primarily dialogue driven, with minimal opportunity for significant rear channel effects, I found the actor's voices to be constantly clear and distinguishable. The overall flatness of a mono track does not hamper Audrey Rose. There is minimal hiss present. Mono tracks are also provided in French and Spanish. Extras Review: The only supplement offered here is a quickie full-frame theatrical trailer that only contains one scene from the film. It's listed as a theatrical trailer, but it is more of a teaser. Most of the focus is given to the bestselling De Felitta book, with Audrey Rose the film mentioned only as "coming soon." A meager set of MGM's typical 16 chapter stops, along with French and Spanish subtitles (no English! ), complete the minimal extras. Audrey Rose has not aged well. It comes across as very slow moving, with very little in the way of suspense. Performances by Anthony Hopkins and Susan Swift are both strong, yet the overall product is flawed. The plot is intriguing, but the execution is inconsistent and far too long. I recommend De Felitta's book, which was, and still is, a darn good read.